NICE recommendations are based on systematic reviews of best available evidence and explicit consideration of cost effectiveness. When minimal evidence is available, recommendations are based on the Guideline Development Group’s experience and opinion of what constitutes good practice. Evidence levels for the recommendations are given in italic in square brackets. Ensure that patients have the best chance of early diagnosis by prompt attention to warning symptoms and promotion of public awareness of these (box). Find out what the patients knows, provide accurate and easy to understand verbal and written information at appropriate times in the pathway, and support patients and carers as they receive information. Consider the use of purpose designed decision aids. Document the discussions clearly, and offer patients a copy. Share information among healthcare professionals, including any advanced decision. If the patient does not wish to confront some concerns, this should be respected. Ensure that a clinical nurse specialist in lung cancer is available at all stages of care to support patients and carers. Choose investigations that give the most information about diagnosis and staging with least risk to the patient. Think carefully before performing a test that gives only a diagnosis when information on staging is also needed to guide treatment (fig 1⇓). Ensure that positron emission tomography with computed tomography (PET-CT) and needle biopsy guided with endobronchial ultrasonography or endoscopic ultrasonography are available in every cancer network. Audit the local test performance of endobronchial and endoscopic ultrasonography and of transbronchial needle aspiration without ultrasonography guidance. For modern chemotherapy, tumours must be classified accurately, so ensure that diagnostic samples are adequate to permit pathological subtyping and measurement of predictive markers. If computed tomography (CT) scans show peripheral lesions, do PET-CT, followed by either definitive treatment or transthoracic biopsy, but take a biopsy specimen from any nodes that show uptake of fluorodeoxyglucose. However, if initial CT scans show enlarged (≥10 mm short axis) mediastinal nodes, take a biopsy specimen from the nodes rather than the primary lesion as the extent of disease in the nodes will have the most bearing on treatment. Assessment of the mediastinal lymph nodes requires a different approach depending on the size of nodes and hence the probability of malignancy. -For nodes >20 mm maximum short axis on CT scans, the preferred options are neck ultrasonography or non-guided transbronchial needle aspiration (during standard bronchoscopy). -If neck nodes are seen on CT scans, offer neck ultrasonography as the first test. -For lymph nodes 10-20 mm maximum short axis, offer as the first test one of: PET-CT; transbronchial needle aspiration guided with endobronchial ultrasonography; fine needle aspiration guided with endoscopic ultrasonography; or transbronchial needle aspiration without ultrasonography guidance. These patients have an intermediate probability of mediastinal malignancy and are potentially suitable for treatment with curative intent. Consider magnetic resonance imaging or CT of the head in patients selected for treatment with curative intent, especially in stage III disease. -Operative mortality—Consider using a global risk score such as Thoracoscore5 to estimate the risk of death. Ensure that the patient is aware of this risk before consenting for surgery. -Cardiovascular morbidity—Minimise this by ensuring early optimal cardiovascular treatment, avoiding surgery within 30 days of myocardial infarction, obtaining a cardiology opinion for patients with active cardiac conditions (including stents) or three or more cardiovascular risk factors, and considering revascularisation, if indicated, before lung cancer surgery. -Lung function and exercise testing—Offer preoperative spirometry (and transfer factor when breathlessness is disproportionate or the patient has other lung disease) combined with segment counting to estimate postoperative lung function; however, patients may still be offered resection if their predicted postoperative values are <30% of the predicted value and if they accept the risk of dyspnoea. Consider using shuttle walk testing or cardiopulmonary exercise testing to clarify the risk of dyspnoea in patients with borderline fitness. Combined modality treatment (which comprises different treatments, such as surgery, radiotherapy, and chemotherapy, in combination either concurrently or sequentially) offers improved survival compared with single modality treatment. Thus consider chemoradiotherapy when surgical treatment is not possible. Arrange an assessment by a thoracic oncologist within one week of deciding to recommend treatment. For patients with limited disease, offer concurrent chemoradiotherapy or, if a patient is unable to tolerate this, sequential chemoradiotherapy. Consider surgery in patients with early stage small cell lung cancer (tumours ≤3 cm diameter without nodal disease). For patients with extensive disease, offer platinum based combination chemotherapy if they are fit enough. For patients with relapsed disease, offer second line combination chemotherapy, informing those who did not respond to first line treatment that there is little evidence that further chemotherapy will be of benefit; offer radiotherapy to treat local symptoms. The table⇓ describes the available endobronchial treatments. For patients with large airway involvement, monitor clinically and radiologically for potential obstruction so that external beam radiotherapy or endobronchial treatment can be given early. Every cancer network should ensure that patients have rapid access to a team capable of providing interventional endobronchial treatments. Offer all patients an initial specialist follow-up appointment within 6 weeks of completing treatment to discuss ongoing care. Offer regular appointments thereafter, rather than relying on patients requesting appointments when they experience symptoms. Offer protocol driven follow-up by a lung cancer clinical nurse specialist and ensure patients know how to contact her/him. It is important to overcome a nihilistic approach that has existed in the past towards lung cancer, and may still exist. Thus this guideline aims to help healthcare professionals and patients understand that a modern approach to early presentation, assessment, and treatment can improve survival and mortality. Another barrier to implementation of this guideline is the perception of limited resources preventing rapid access to diagnostic tests. This can often be overcome by enthusiastic and dedicated healthcare teams that realise that tests that have to be done at some stage in the pathway may as well be prioritised and done quickly. A dedicated team is essential. The capacity to provide certain diagnostic tests (such as endobronchial ultrasonography) needs to be increased, and again this depends on enthusiastic clinicians. 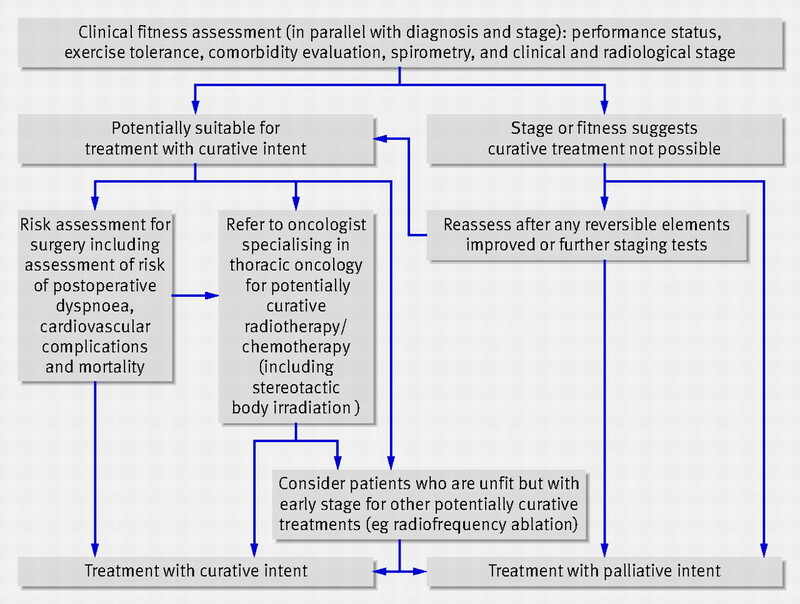 Access to lung cancer clinicians willing to deliver state of the art treatment to patients with borderline fitness or with tumours that are difficult to treat (such as by resection) can be limited, and all cancer networks must have sufficient clinicians. Although radiotherapy capacity is being increased in the UK, it will remain limited in the near future. Inequality exists in the quality of the diagnostic approach for lung cancer, including adherence to the previous NICE guidance, delivery of treatment with curative intent, and delivery of active treatment. The National Lung Cancer Audit has shown that histological confirmation rates vary from as low as 25% to over 85%; only 75% of patients have computed tomography before bronchoscopy (NICE recommendations from 2005); surgical resection rates vary from less than 5% to over 25%’ and active treatment rates (surgery, chemotherapy, or radiotherapy) vary from 10% to 80%.3 It is thought that the updating of the NICE guidance with implementation tools such as the development of directly derived quality standards will encourage better practice. Other initiatives such as the National Awareness and Early Diagnosis Initiative will encourage the public and patients to present earlier and will provide more opportunity for patients to receive the most effective, guideline driven care. Patients with small cell lung cancer are offered the most effective treatment approach. The overall aim is to ensure that all healthcare professionals are aware of the important advances in the management of lung cancer and that patients can see that clear patient centred guidelines exist. The update was unable to include the fast developing area of chemotherapy for non-small cell lung cancer owing to NICE’s recent, previous, and ongoing technology appraisals. This guidance was developed by the National Collaborating Centre for Cancer (NCC-C) in accordance with NICE guideline development methods.10 A Guideline Development Group was established by the National Collaborating Centre for Cancer, which incorporated healthcare professionals, patient and carer members, and NCC-C staff. The GDG identified relevant clinical questions, collected and appraised clinical evidence, and evaluated the cost effectiveness of proposed interventions where possible. The draft guideline underwent a rigorous reviewing process during which stakeholder organisations were invited to comment; the GDG took all comments into consideration when producing the final version of the guideline. NICE has produced four different versions of the guideline: a full version containing all the evidence, the process undertaken to develop the recommendations, and all the recommendations; a quick reference guide; a version containing a list of all the recommendations, known as the “NICE guideline”; and a version for patients and the public. All these versions are available from the NICE website (www.nice.org.uk/CG121). Further updates of the guidance will be produced as part of the NICE guideline development programme. Using randomised controlled trials, what is the value of imaging modalities and other interventions in monitoring response and recurrent disease? Contributors: All authors contributed to the conception and drafting of this article and to revising it critically. They have all approved this version. The guarantors are DRB, BW, ARC, and John Graham (director at the National Collaborating Centre for Cancer, which developed the guideline). Funding: The National Collaborating Centre for Cancer was commissioned and funded by the National Institute for Health and Clinical Excellence to write this summary. Competing interests: All authors have completed the Unified Competing Interest form at www.icmje.org/coi_disclosure.pdf (available on request from the corresponding author) and declare: MS-H and AMM had support from the National Collaborating Centre for Cancer for the submitted work; DRB and BW received payment for attendance at committees and for travelling and accommodation costs in accordance with NICE policy; there are no other relationships or activities that could appear to have influenced the submitted work. Cancer research UK. Cancer mortality—UK statistics. http://info.cancerresearchuk.org/cancerstats/mortality/. Coleman MP, Forman D, Bryant H, Butler J, Rachet B, Maringe C, et al. Cancer survival in Australia, Canada, Denmark, Norway, Sweden, and the UK (the International Benchmarking Partnership): an analysis of population-based cancer registry data. Lancet2011;377:127-38. NHS Information Centre. National lung cancer audit 2009. IC23090809. www.ic.nhs.uk/webfiles/Services/NCASP/audits%20and%20reports/NHS%20IC%20Lung%20Cancer%20AUDIT%202009%20FINAL.pdf. National Institute for Health and Clinical Excellence. 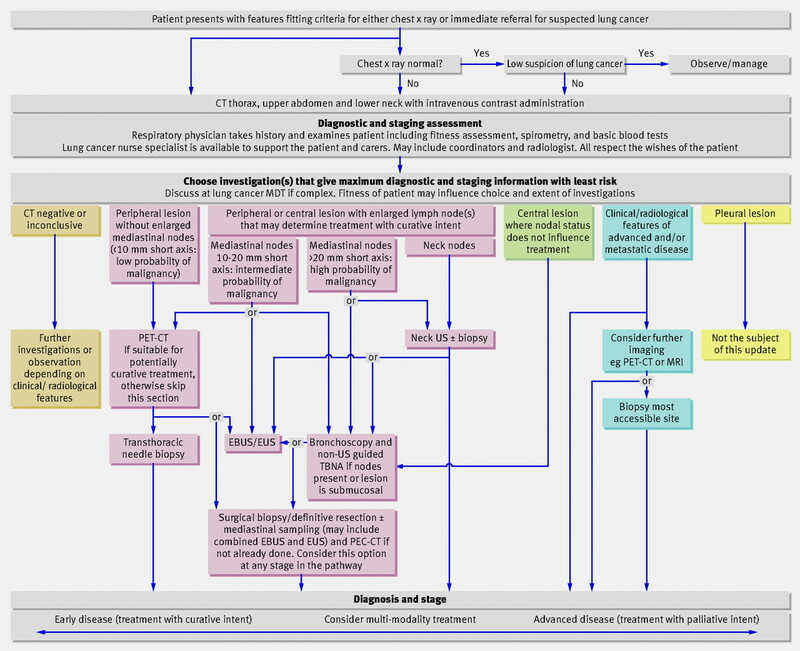 The diagnosis and treatment of lung cancer (update). (Clinical guideline 121) 2011. http://guidance.nice.org.uk/CG121. Falcoz PE, Conti M, Brouchet L, Chocron S, Puyraveau M, Mercier M, et al. The thoracic surgery scoring system (Thoracoscore): risk model for in-hospital death in 15,183 patients requiring thoracic surgery. J Thorac Cardiovasc Surg2007;133:325-32. National Institute for Health and Clinical Excellence. Erlotinib for the treatment of non-small-cell lung cancer. (Technology appraisal 162.) 2008. www.nice.org.uk/ta162. National Institute for Health and Clinical Excellence. Pemetrexed for the first-line treatment of non-small-cell lung cancer. (Technology appraisal 181.) 2009. www.nice.org.uk/ta181. National Institute for Health and Clinical Excellence. Gefitinib for the first-line treatment of locally advanced or metastatic non-small-cell lung cancer. (Technology appraisal 192.) 2010. www.nice.org.uk/ta192. National Institute for Health and Clinical Excellence. Topotecan for the treatment of relapsed small-cell lung cancer. (Technology appraisal 184.) 2009. www.nice.org.uk/ta184. National Institute for Health and Clinical Excellence. Guidelines manual. 2009. www.nice.org.uk/media/5F2/44/The_guidelines_manual_2009_-_All_chapters.pdf.